Star Trek The Next Generation. Waffle On About Star Trek The Next Generation. 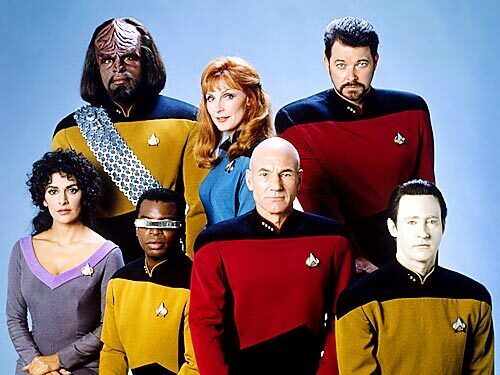 Star Trek The Next Generation is as weall know an American television programme so why are we waffling on about it. Well Its simple. Once a year Waffle On is going to do a show about a prominent American programme that had a big effect on both Meds and Kell. This year its time for TNG. Star Trek TNG hit our screens in the mid 1980's and impressionable young lads that we were (and geeks at heart) we both jumped into the magical world of this brilliant programme. Plus we both quite fancied Tasha Yar and Deanna Troi. The first few series of TNG were a bit crap, and we say that in our own friendly banter way but the other four series were brilliant. This episode is a little bit longer than normal but it is packed with listener mp3's from Rico, Al, Rick, Kenny, Harry, Jen, Angela, Sue, Sarah and a brilliant email from Katrin so we hope you enjoy it. As always thanks for listening and make it so.